Saint Monegundis was a native of the town of Chartres in France. There she was married and had two daughters. When her two daughters died young she decided to become a nun, because she feared lest in her grief and depression she should become so centered in herself as to be unmindful of God. With her husband's consent she built a cell in the town and lived there in solitude, subsisting on as little food as possible and with no furniture except a floor mat on which to sleep. The little light she received in her cell came through a very small window. Her only food consisted of bread made of barley-flour and mixed with ash, which she cooked herself. A young girl ministered to her, bringing her food every morning, but somewhat wearied with the monotony of her task, the girl ran off, and left the recluse for five days without food. Gregory of Tours, her biographer, relates that the snow fell round the cell, and Monegundis put forth her hand from her window, and allowed the snowflakes to gather and heap up on her palm, then she drew in her hand, and made a pancake of the snow. Adjoining her cell was a little garden in which she walked, and where she tended flowers. As she was walking in the garden adjoining her cell, a neighbor who was putting some wheat to dry on the roof of her house looked at her with an indiscreet curiosity, and immediately she became blind. Monegundis said in desperation: "Woe to me! For a tiny offense done to my littleness, others have had their eyesight taken away!" She threw herself into prayer, then, touching the woman and making the sign of the Cross, her eyesight returned. After this she also healed a deaf man. 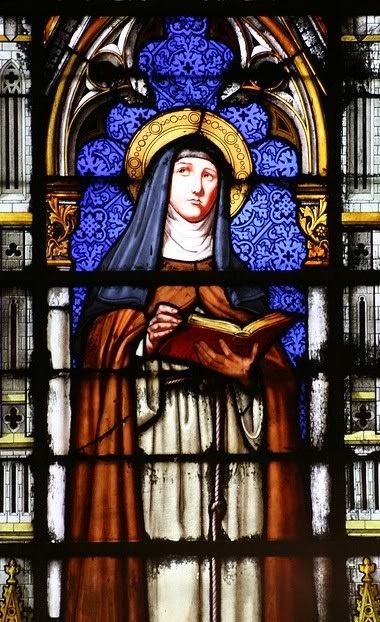 To avoid the fame caused by her miraculous powers of healing, she decided to move to Tours and live in a cell near the tomb of Saint Martin of Tours, following the same strict rule of life. On her way she stopped at Avoine where they were celebrating the vigil of Saint Medard whose church had his relics. After a night of prayer, during the Divine Liturgy of the next day, she saw a young girl come to her, swollen by a malignant pustule, and threw herself at her feet saying: "Help me! Cruel death strives to tear me from life!" Monegundis prostrated himself, entreated God, then, rising, made the sign of the Cross. This resulted in the opening of the tumor, which split into four, the pus drained, and death departed from the young girl. It is not unnecessary to remark here the quasi-surgical precision with which Gregory relates the cure. Arriving in Tours, Monegundis thanked God for making her worthy to behold the tomb of Saint Martin of Tours. She settled in a small cell nearby and lived in fasting and prayer. The miracles continued when the daughter of a certain widow was cured of the contracture of her hands. Finding that people crowded to visit her, her husband brought her back to Chartres. There she lived in her former cell and increased her fasting and prayer. On the death of her husband, however, she returned to Tours, and remained there as a recluse. 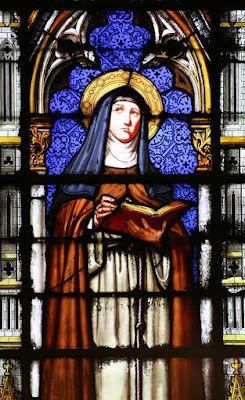 The people of Tours came to revere Monegundis, and she was joined by a large number of women who were keen to dedicate themselves to God, and the cell of Monegundis became the center of the Convent of Saint Pierre-le-Puellier. Gregory describes their manner of life as follows: prayer, reception of the sick, barley, wine on feast days, rush mats for bedding. And the miracles continued: a girl covered with ulcers was healed after Monegundis spread her saliva on them, a young man with a venomous snake in his belly was cured when she put a vine leaf smeared with her saliva on it and made the sign of the Cross, and a blind man was cured after she placed her hands on him. When Monegundis was about to die, her companions begged her to bless some oil and salt in order to be able to distribute to the sick after her departure that they may receive her grace. She reposed in peace in the year 570, buried in her cell, and her tomb became a place of pilgrimage, especially for the sick; many cures were attributed to her intercession and through the blessed oil and salt. Even after death, she appeared to people with humility and elevating the veneration of Saint Martin. For example, a blind man, praying at the tomb of the Saint, fell asleep. Saint Monegundis appeared to him in a dream and said to him: "I consider myself unworthy of being equal to the saints. You shall here recover the light of one eye; then run to the feet of Blessed Martin and prostrate before him in the compunction of your soul. He will give you the use of the other eye." And this indeed took place. The shrine to Saint Monegundis was destroyed by the Protestant Huguenots in 1562, but most of her relics were saved; they were solemnly re-enshrined in 1697.